Embargoed for Release: 10:30 a.m. EST, May 26, 2003; Figures with extended captions and movie files follow release text. 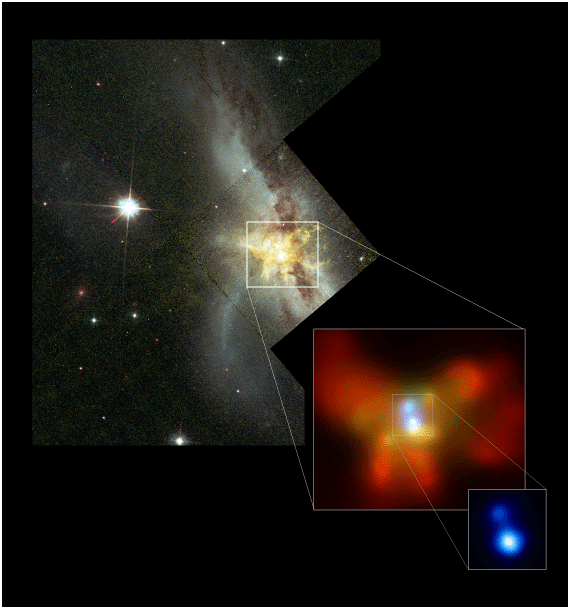 ����������� New Haven, Conn. � A group of astrophysicists at Yale has calculated the fate of a pair of supermassive black holes at the center of a galaxy, showing that they spiral inward and coalesce quickly when a large amount of gas is present. The work presented today at the American Astronomical Society meeting in Nashville, Tenn. consists of a series of numerical simulations of an orbiting pair of black holes embedded in a massive gas cloud. Such gas clouds are often observed at the centers of ultra luminous infrared galaxies, objects that are interpreted as mergers in progress. �Our work explores this question and suggests that, in a merger of galaxies containing a reasonable amount of gas, the answer is yes and the central supermassive black holes coalesce shortly after the galaxies merge,� Escala said. �The orbiting black holes are predicted to spiral together and sink toward the center because of the gravitational drag effect produced by the gas, which tries to follow the motion of the black holes but always lags behind,� said Larson. The simulations show that the black holes spiral inward and form a massive close binary system at the center of the galaxy. Once the binary has formed, it creates an ellipsoidal enhancement in the density of the surrounding gaseous medium that trails behind the binary. �The decelerating torque exerted by this trailing ellipsoidal enhancement makes the black holes continue to approach each other,� Coppi said. This result differs considerably from that obtained when the background is made entirely of stars instead of gas because the binary then acts as a baseball bat that knocks out all the stars that pass too close to it. �The ejection of the stars produces a hole in the surroundings of the binary, causing the coalescence to stall when the binary is formed,� Coppi said. In the new simulations with gas, however, the gas is not ejected but remains concentrated near the black holes. The detection of such gravitational waves would be a major test of Einstein�s theory of general relativity, and it would also provide direct evidence for the predicted merging of supermassive black holes in galactic nuclei. Here is an MPEG version of the simulation Figures 1 and 2 were drawn from. This movie shows a sequence consisting of (1) a computer simulation of the merging of two galaxies (2) HST and Chandra views of an actual merging galaxy system (a �cosmic train wreck�) with two supermassive black holes inferred to be very close together and near the center of the system (3) a simulation of two black holes spiraling together at the center of a dense gas cloud, and (4) a trailer depicting the gravitational radiation emitted by the two black holes as they finally coalesce into one black hole.